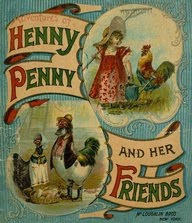 So, this pretty much shows you how the entire month of May has been out here on Henny Penny Lane. Seriously! Oh, we've had a day of sunshine here and there, but very few. Never in my life!! Been seriously thinking about building, (an ark, is what I should say), but no, I was thinking of some kind of scaffolding for the chickens to walk on. Something that that will lift them above the mud and gunk. Can't even do that until the rain lets up. Eli had an appointment with the vet today. This wet weather must be good for the ferns that grow around the rain barrel at the end of the porch. Glad something is enjoying all this rain and humidity! Haven't had much to post about lately, and hate to keep talking about the weather. Surprise, because I had no idea what the color would be. I bought them last year after Mother's Day. The blooms had fallen off and Lowes had reduced them to $3.00. Like most folks, I've been busy in the teeny tiny garden. It's looking kinda pretty, but doesn't show that way in a picture. Not yet anyhow. See, it's a little skimpy looking. 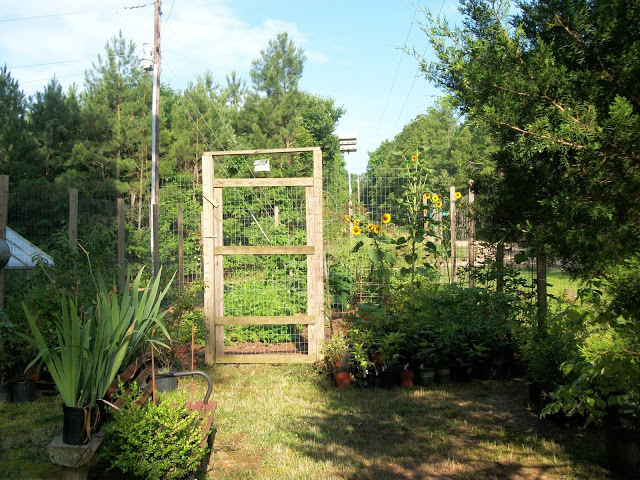 I've built four tee pees; one each for crookneck squash, cucumbers, zucchini, and pole beans, and did get around to building the little wattle fence for the green beans. 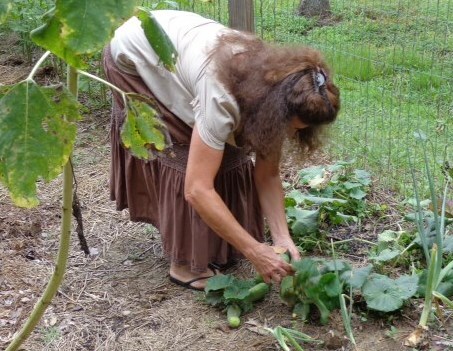 There are also two eggplants, four tomato plants, two pepper plants, short row of okra, onions, and leeks. 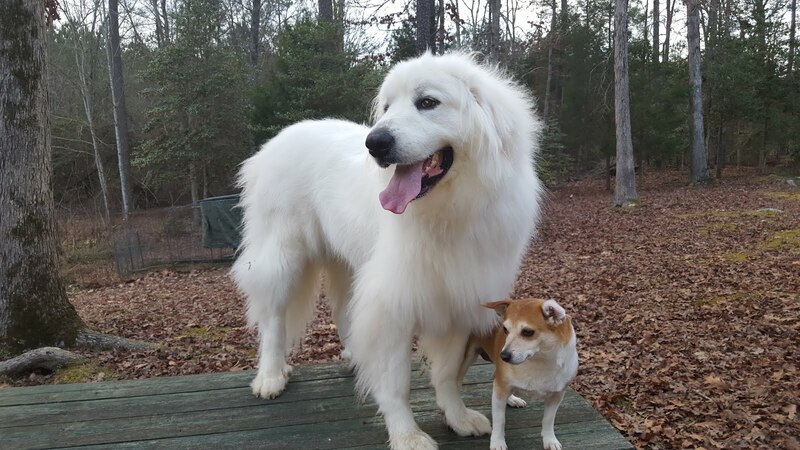 When all is big and healthy, I will take another picture. 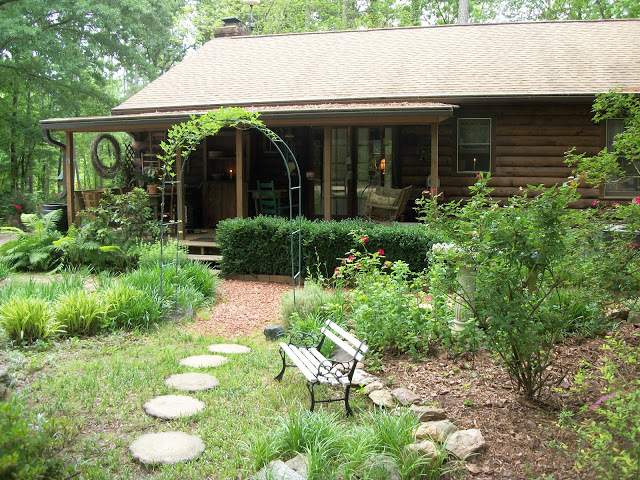 just a little view of the garden from the outside. Have you ever seen so much yarrow! Last summer I bought a pot of yarrow and put it in the herb garden...it bloomed a little and never came back. This, however, is wild yarrow and has taken over part of the front yard. After mowing down lots of it, I decided to leave this patch and watch it bloom. What is yarrow good for anyway? Guess I'll get up from here. Poppy had to work a few hours today, but will be home shortly. I'm simply beat, friends. I've mowed the back forty, :) (wish we had a back forty), I've potted up several plants, hauled several wheelbarrow loads of leaf mulch to put between the garden rows, cleaned out four bunny boxes and added fresh hay, and let's see...there's more, but I'll stop here and go find something to cook for supper. Thank you, if you are still here. Sure wish I had kept a journal beginning the first day of January 2018. If nothing else, there would have been plenty of entries about our weather. Remember the pretty spring-like weather in January and February; then winter returned in March and April with cold frosty mornings and even some snow; well now, here in the merry month of May, we're having hot, sticky, stormy July and August weather. Why, at this rate I probably need to go ahead and prop the yard rake against a tree. 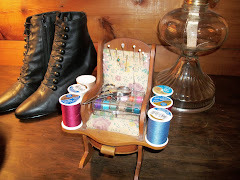 Wanted to show you the little iron table and chairs we bought off Craigslist. Last Saturday, before the rain set in, we put the slats back on the chairs and thenPoppy painted them for me. The two chairs are sturdy and very heavy. We got both for $20.00. The iron table, posted by someone else, was also $20.00. Poppy sat down in one of the chairs and asked if I would bring him a cup of tea. Want to show you a simple change I made in the house. The windows in our living are exactly the same as the windows in our bedroom; same number of windows, size, curtain rods and all. 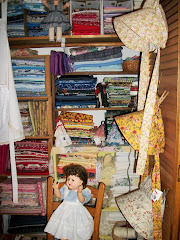 and had the gold curtains that match the bedspread in our bedroom, hanging in the living room. Duh! I sure appreciate your friendship. She adored dainty little pitchers and violets. She loved picking violets. 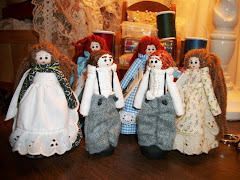 We used to go see Aunt Berlie in early spring when the grass was green and the yard was covered in violets. Mama would say, "let's ride up and see Berlie. I bet the violets and wild lilies are in bloom". 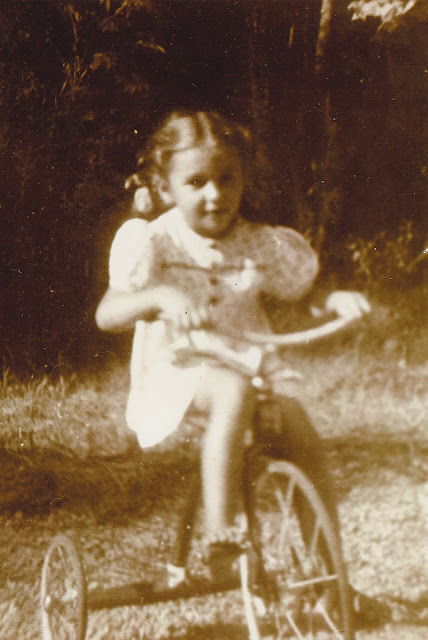 Aunt Berlie was a dainty little lady too. I loved walking with them and picking flowers. Both of them carried a tissue, and laughed continuously ! 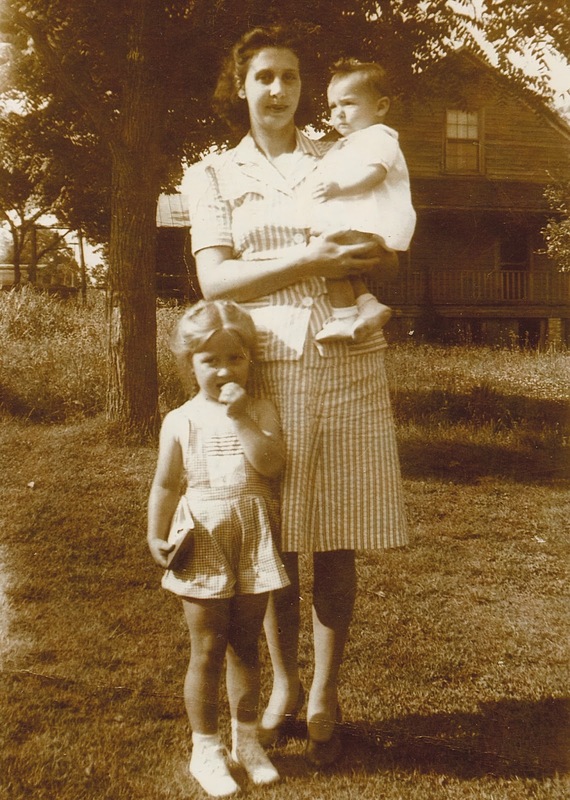 of my sweet mother, holding me with my sister Shelby standing beside her. I miss her and think about her every day, and it doesn't get any easier. In fact, the more time passes, the more I long to see her and hear her voice again. 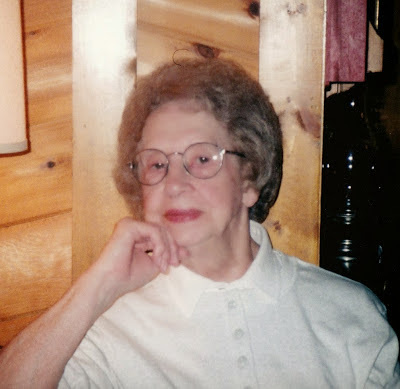 Mama was gentle and kind, and very patient. Poppy said this morning, you are not my Mother, but I'll take you to Cracker Barrel for breakfast for Mother's Day. I accepted. We were about ready to go when my daughter Andee called. Check your email before you leave...so, I did and there was a gift certificate for Cracker Barrel. How was that for perfect timing! I had pecan pancakes with bacon and lots of maple syrup, then came home feeling too full! It was fun! Happy Mother's Day too, to my sweet Daughters Lynn and Andee! This silly frog holds down the lid on the old washing machine tub where I keep the potting soil. Never thought of taking his picture until I placed the flower on his head. Poppy brought home a couple of these wild lilies with the bulb still attached so I could try growing them. He was turkey hunting and came upon a big patch of these lilies. I suppose this little fellow was waiting for a lily for his head. Peonies, a few days ago. Peonies before the storm Thursday evening. The wind and rain messed them up a bit, but still pretty. Never seen an Iris grow this tall. Iris near the front porch. It's very dainty and beautiful, and look at the ties with lace on the ends. for $1.00 and it was in the bottom of a box of old aprons. Speaking of aprons, this one has been made for weeks now. I finished it and forgot about it. .. I stitched on a little embroidery thread to make the pockets stand out. with a little chicken family stitched on the end. Reminds me of the baby chicks that are hatching here. We have three so far with another hen sitting on two eggs. We really don't need more chickens, but these hens are bound and determined to hatch an egg. Tired of arguing with them, I gave in and gave each of them two eggs to sit on. Things have quietened down considerably in the chicken house. But there's hardly room for both of us! Couple of things here...well maybe three, or four! like here in my bare feet...we were living here when, riding on the back of Shelby's bicycle, my heel caught in the bicycle chain. I remember my cut heel and the screaming and crying and scaring mama half to death. And do you remember how easy is used to be to find broken glass on the ground? Seriously! We played Hopscotch, a lot! and the first step in playing was to find a piece of glass to throw. It was easy finding a piece...probably because back then, late 1940's, folks had trash piles where they dumped their garbage. There was no plastic, so it would have been just broken dishes, wood, paper, metal cans. It was fun looking for a pretty piece of a broken dish to play with. Then in the 1950's after we moved from South Carolina back up to North Carolina...I was playing barefoot in the back yard and stepped on a jagged piece of a broken drinking glass. A jagged edge went between my toes, making a pretty bad cut. Oh, and wading in mud puddles after a big rain. 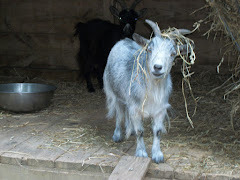 Now that was fun, except for mama telling us over and over how we would get worms. And stepping on honey bees in the clover! The many stings I've had on the bottom of my feet! And next friends, somehow, I deleted the main picture I wanted to show you of the strawberries Shelby and I picked. Duh! So, it will be at the bottom of this post. And, thank you to my new follower. :) Whew! am I about caught up? is making junk journals. This must be the thing, now! I was just watching and listening to her YouTube video about her latest journal, "The Lusty Month of May", springtime junk journal. When she finished the journal and listed it in her Etsy shop, it sold in two minutes! and all her journals sell like that. 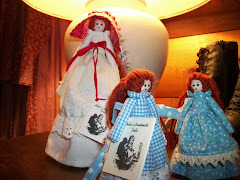 Anyhow, if you would like to see that springtime journal, or how she makes these journals; it amazes me, go to youtube and enter abitofbirdsong then click on the one titled Lusty Month of May. I think it's pretty neat! She sure got her confidence and nerve from her dad and not from me. Goodness no! Shy and backwards growing up; that was me...and haven't changed much over the years. Why, I used to ask mama if it was alright if I ate one of the biscuit she had cooked for breakfast. Once, when I was a teenager, I walked all the way to the garden where mama was busy chopping to ask if it was alright if I took a bath and was it alright to use the bar of soap laying on the bathtub. Scared to death of doing something wrong! Don't you bet mama got tired of my questions? If she did, it never showed. Okay, now I'm off to finish vacuuming, then it's outside to pick up sticks and limbs. We were under a severe storm warning late yesterday afternoon. Got high winds and lots of rain! The craziest feeling of wanting to go barefooted came over me the other day. It was Thursday while mowing, and all my toes were hurting. How good it would feel to walk on the cool ground so making the next round with the mower past the bench, I stopped and pulled off my boots and socks. It was wonderful! So, no more boots for me this summer! I'm going barefooted! Gosh, we used to start in early, early, spring, begging mama to let us go barefooted. We would beg and plead until she would say, "oh go ahead, and if you catch pneumonia, don't come running to me". I remember exactly how it felt back then to take my shoes and socks off and walk on the ground for the first time. Got that same feeling last Thursday. and should have cut off more. Please overlook the beat up chair legs. Hopefully, one of these days I will find six sturdy dining chairs in a thrift store. the vase on the table holds "sweet betsy" my neighbor Ann broke from the bush in her yard. I've tried and tried to grow a sweet betsy, or as mama used to call them, "bubby bush". Oh, and about my sister Shelby and I picking strawberries...it was fun! There were acres and acres of big beautiful strawberries, hanging in clusters. We carried our buckets and pans and walked to the far end of one row, thinking, as Shelby suggested, we won't have so far to walk back. But, good grief, our buckets and pans were full before we had picked a third of the row. We both brought a cooler with ice so we could go in a thrift store and then eat lunch. I really wanted to show you the strawberry field, but had left my camera in the car, daggone it! This was some of the corn and tomatoes, just getting started. Can't wait to post about the teeny tiny garden here and what's been planted. Now if it will just grow! Oh, and the playhouse. Poppy has been working on the two chairs we found on Craigslist, and the iron garden table. I was out at 8:30 this morning; digging and chopping, and moving things around. It's May, after all! My favorite month of the year! Okay, time is flying. Be back soon, I hope. PS I was reading on line about the health benefits of going barefooted. Says it can help you sleep better. Sounds good to me. Where to begin! Berry picking with Shelby, or about the little black hen and the chicks that are hatching, or about the garden and what's been planted, or maybe show you the new iron table and chairs for the playhouse...bought off Craigslist. Wait, I'll begin by saying "thank you" to new followers. Slack as I've been, you probably hate you stopped by, but please come back. I do appreciate you! 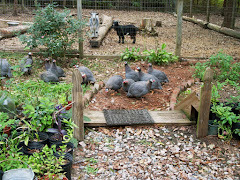 It has been total chaos in the chicken house for weeks now, with half the hens trying to "set". Like they are playing musical chairs. Hens moving from nest to nest, fussing and fighting over the eggs. That little black hen took over one of the nest boxes and settled in to hatch three eggs that another hen had been sitting on. 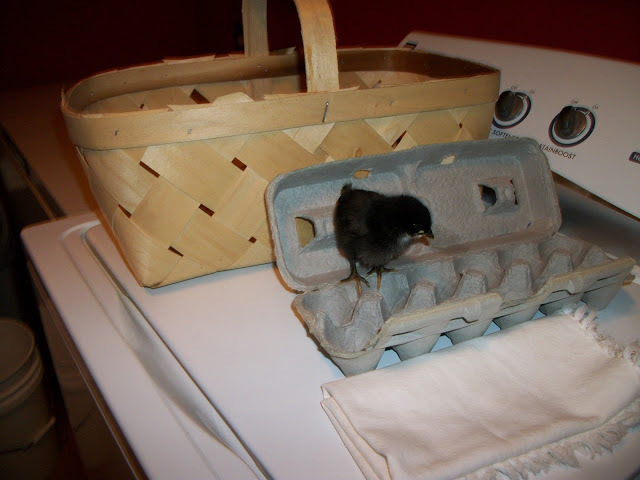 Well, it wasn't long before the little black hen found herself with two baby chicks. 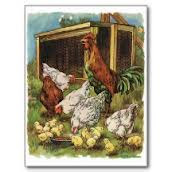 On the third day with nothing more happening, I moved the little black hen and her two babies to a separate pen, and put that unhatched egg under another cranky hen. 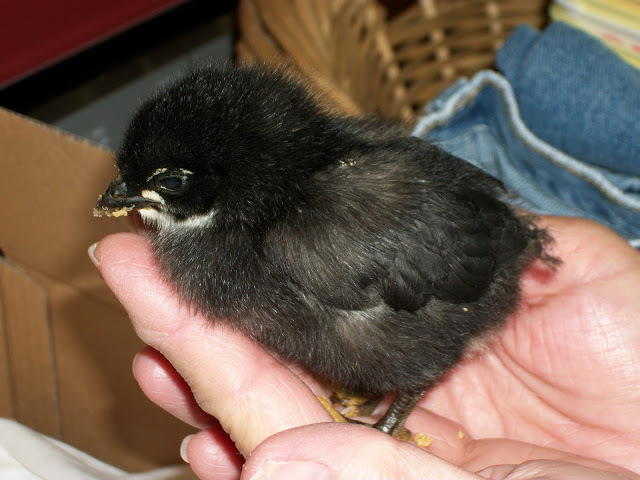 There is a story behind this little black hen, in fact, she was the subject of one my very first posts, way back in 2013, when I started blogging. Poor sweet baby. Once she was dry and warm, she tried to eat. 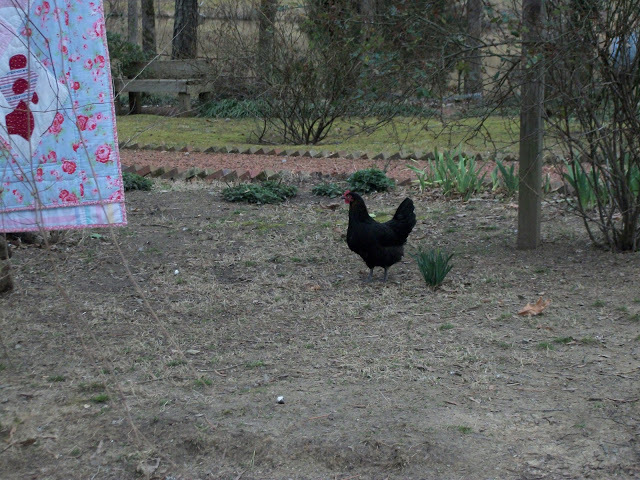 She recovered and grew into a healthy black hen. and now she is a mama. So cute!! Can't believe we've got a post here, such as it is! I will save the berry picking and playhouse for next time. Thank you for visiting. Hope to be back soon. Very soon!